Well, you know it had to happen eventually. 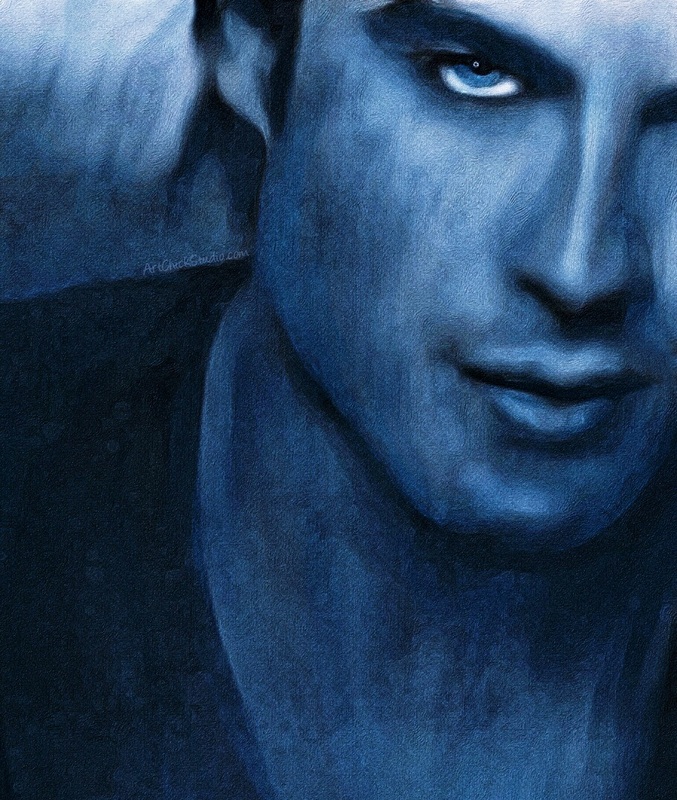 I HAD to create a portrait of Ian Somerhalder to add to my Celebrities in Blue collection. The only difference this time is that, instead of painting him in oils, I created him digitally on my iPad Pro that I got for Christmas. Hello, beautiful man. (Yes, I still love my husband!). Ahem. He is rather gorgeous. I created this using ProCreate and Brushtrokes--two of my favorite art apps. Then I did a little digital enhancement on my computer when I was finished. I love how this turned out. 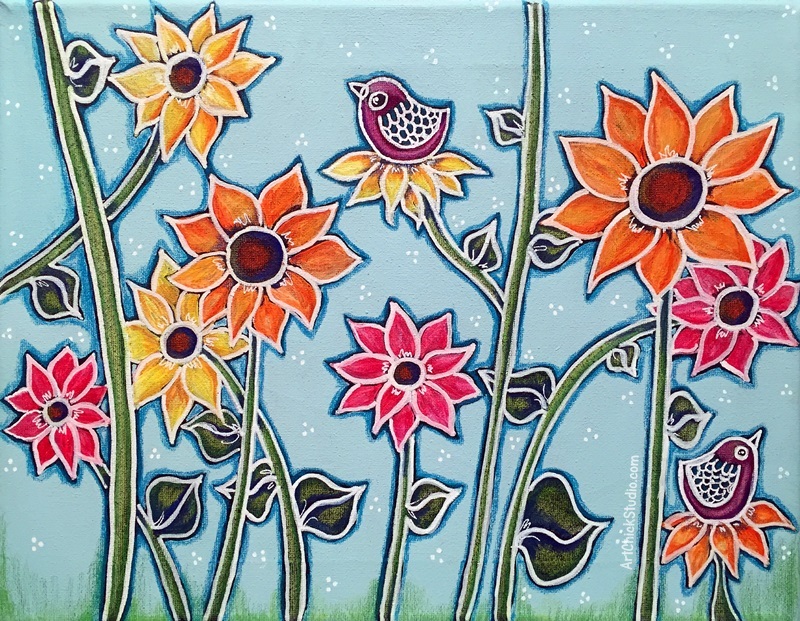 The first lesson involves whimsical birds and flowers, which is what I've created. I can't even tell you how much fun I had creating this painting. And Brandi's videos were very well done and easy to follow. I loved seeing her process, and it was great to use colored pencils in a mixed media painting, which I'd never really done before. So this is the result of the first lesson in Brandi's workshop. 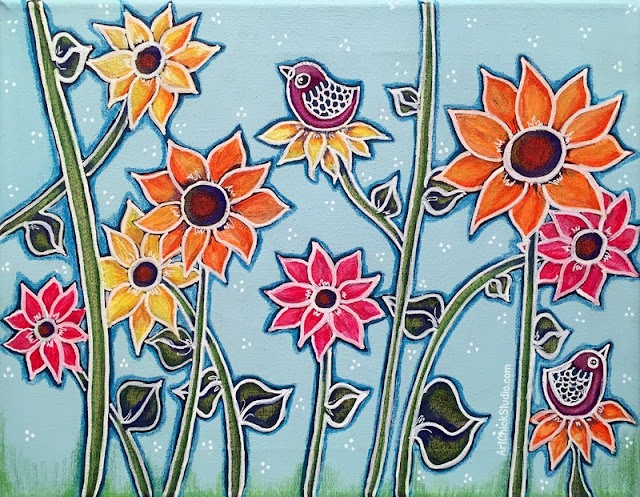 This mixed media painting is a combination of acrylics (the background), colored pencils (the flower stems and leaves, and the birds), Neocolor II Crayons (the flower petals), and paint markers (white outlines and white dots). I loved the whole process of this painting and I definitely want to use the techniques I learned from Brandi in other paintings. That is what I love about watching other artists work: it inspires me to try new things and approach things in brand new ways. And that always helps me to grow as an artist, which is always one of my primary goals. I finally had a chance to finish my recent mixed media painting that I started a couple of weeks ago. I got sidetracked with making party goodies for my granddaughter, Destiny's recent 6th birthday party. She had a Descendants themed party and that was lots of fun! 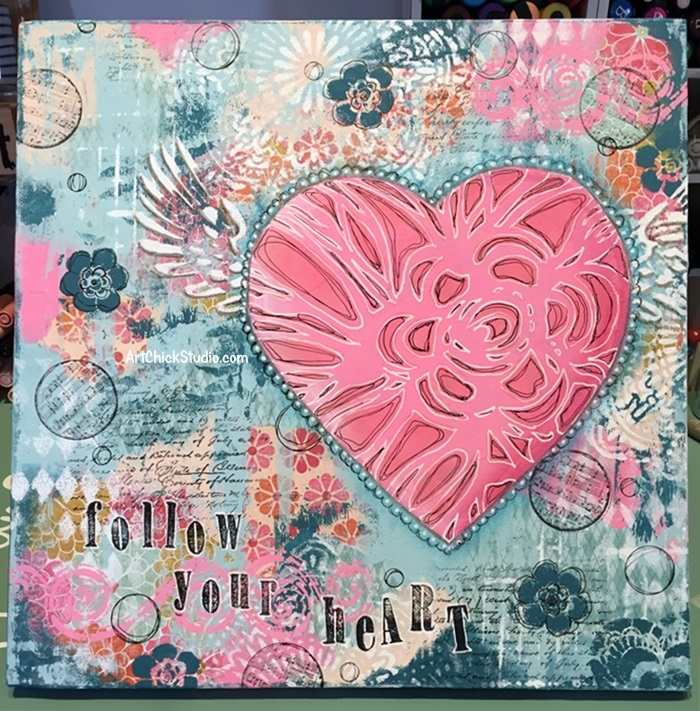 But I was in the studio all day yesterday, and not not only did I finish this Follow Your Heart Mixed Media painting, I also did another one (I'll post about that later). I started with a collage of various scrapbook papers. Then I added some acrylic paints. Then it was time to start layering and adding textures. So I used several different stencils and a few different rubber stamps as well to do that. After doing that I added the heart, and embellished it with a stencil and some markers, and I added the wings with a stencil as well. Then I added a few more rubber stamps, and the lettering. I really like how it turned out. These pinks and aquas are favorite colors of mine anymore. I seem to just gravitate toward them a lot in the studio. What are your favorite colors to paint with?